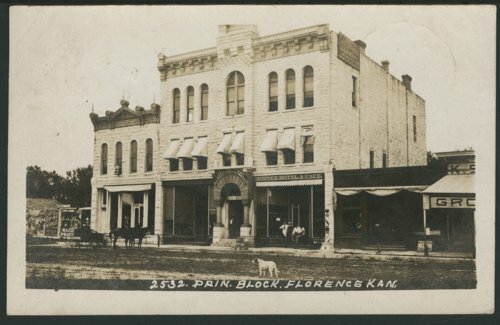 This is a postcard of Horner Block in Florence, Kansas. The postcard captions says "Prin. Block. Florence, Kan." The building on the left is a bank. The large stone building in the center is the Horner Hotel and Cafe. The stone work indicated it was built in 1887. A grocery store is on the far right.